There are few things I love more than cute and fun ways to decorate packages and goodies. No joke. Right now I have a drawer, sleeve of our desk AND giant box in our closet filled with adorable gift, goodie bag, package and snail mail decorating supplies. Like these botanical labels and stickers from Anthropologie. They're kind of my favorite. Every time I bake something special or send a letter I get super giddy because I get to choose "the perfect" added bling for that friend or what have you. I once had a friend gift me with a box FULL of cute stickers, ribbon, twine, rubber stamps, kraft paper goodies, pens, markers and other amazing decorating gift supplies and I squealed an actual squeal upon opening. We were all also at a very fancy smancy place at said time. Sorry friends (not sorry). 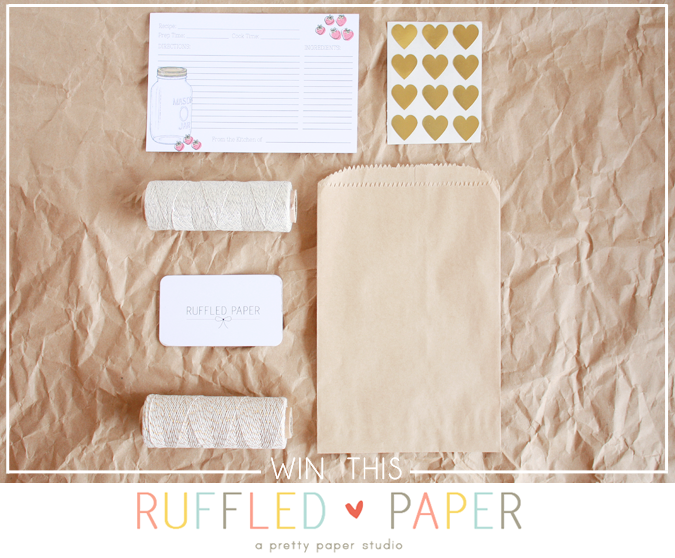 So when I had the opportunity to get some goodies from Ruffled Paper, I jumped on it! I mean, honestly. Look at all the amazing stuff they carry! From stationery to party supplies, invitations to shimmery baker's twine...it's a decorating freak like me's heaven on earth. I did end up grabbing some of that shimmer twine, in both gold and silver. I love the way it jazzes up simple wrapped packages and boxes of baked goods. 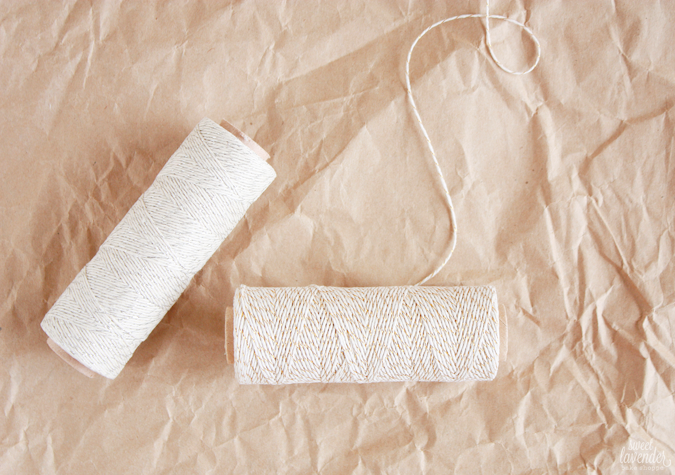 I figure you can never have too much baker's twine. I want all the twine! Something else you can never have too much of? 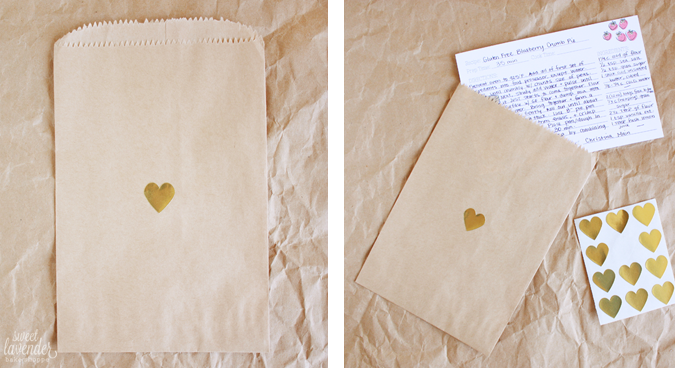 Kraft paper bags and gold foil stickers. Like these gorgeous hearts. I use those bags for everything from gift card wrapping to cookie packaging (just tie closed with some twine or tape shut with washi tape or these heart stickers). They're perfect with a giant decorated sugar cookie or huge fresh baked chocolate chip cookie for a loved one, placed inside. 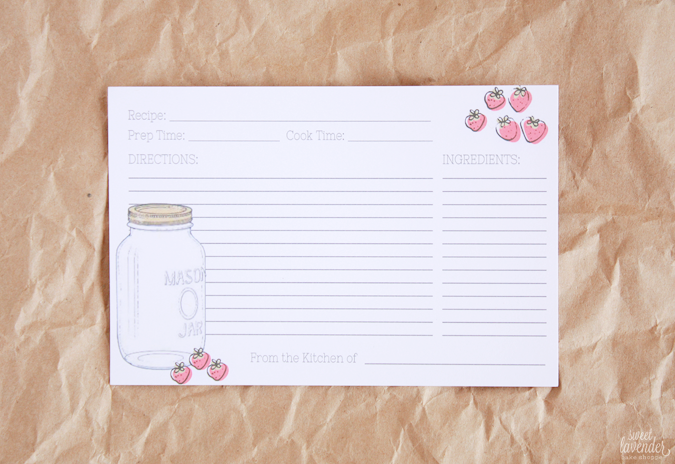 Then there's the pièce de résistance- these adorable strawberry jam recipe cards. Maybe it's because it's summertime, maybe it's because berries (and strawberries at that!) are totally in season right now, or maybe it's because I also have a major slight obsession with recipe cards and all things mason jar...but I had to have these babies in my life. Like, haaaaaaaaaaaaad to. Guys, mason jars. I'm so glad I did get them! They're SO DANG CUTE. They come printed nicely and on heavy cardstock paper and are ready for you to jot down all your favorite recipes, either for yourself or to give away to a friend. These all arrived in perfect condition, packaged all cute and dapper and with great timing too! 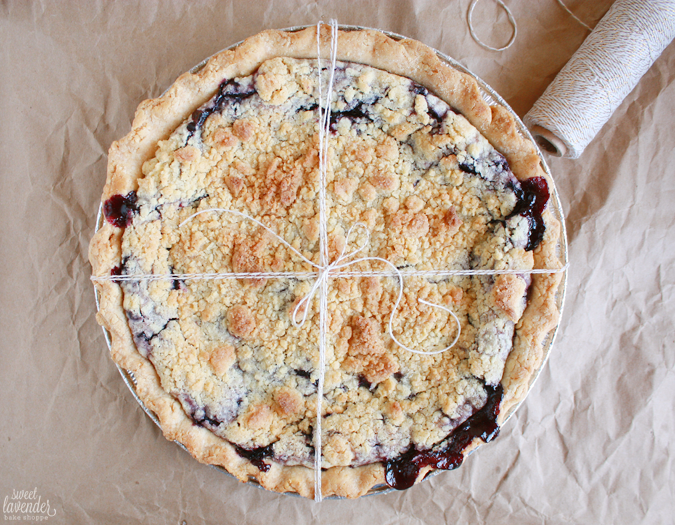 A dear friend of mine, who just had a sweet little boy, needed gluten-free pie in her life pretty much right away. These cute decorative pieces made my baked treat that much more special. Like I said before, I like things simple and love the "less is more" route. So I simply placed one heart sticker on a kraft bag, wrote out the recipe for the pie I was gifting out on one of the mason jar recipe cards, and inserted it into that bag. 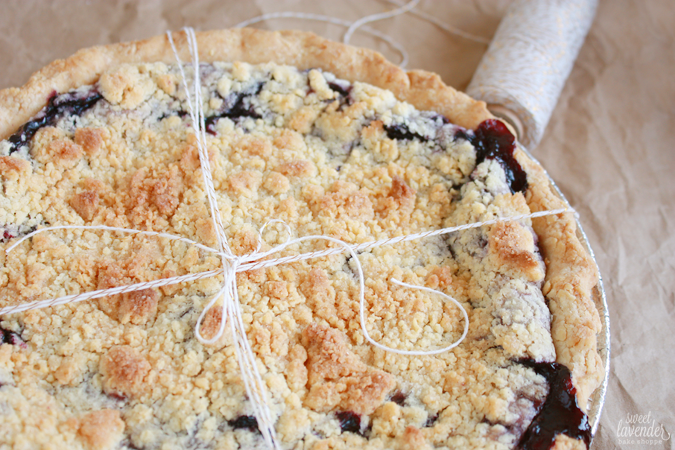 Then I generously wrapped her cooled pie with some of the gold baker's twine (which made it look so fun), tied a little bow, and placed it in a brown paper pie box. I placed the kraft bag with recipe card on top and closed the box up. On the bottom right corner of that box was another gold foil heart sticker. Classy and elegant. Here's the super duper fun part! Jess of Ruffled Paper has generously offered to give one Sweet Lavender Bake Shoppe reader this amazing gift packaging set, as well! Holy cow, right? One of you lucky ducks will win ALL of what you see in this post (except the pie...sorry guys)- a $34 value!!! 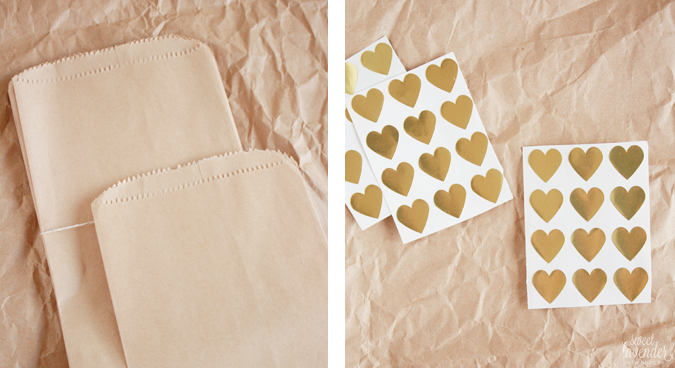 These babes are sure to make you a gift wrapping or snail mail decorating champion. Now for the small print: Ruffled Paper provided me with a free samples of these products to review. I was under no obligation to write a positive review. All pictures and opinions are my own. CONTEST OPEN TO US RESIDENTS ONLY. Contest will run for 7 days and will end on July 15th. Winner will be shown on this blog post upon being chosen AND will be contacted by Sweet Lavender Bake Shoppe via email. Winner has 24 hours to email back and claim prize before a new winner will be chosen. All prizes were graciously donated and shipped to winner by Ruffled Paper. Fun! First, I would have probably squealed as well if someone gifted me a box of goodies like that! Ruffled paper has so many items! I love the silver and gold twine, and the heart stickers, and the gold striped paper straws, and the faith is stronger print... So many goodies! Love this! The strawberry jam recipe cards would be perfect for me to share recipes at canning club! Party Confetti Gold Glitter and Blush is my favorite item! <3 <3 <3 their "bless your heart" print - so cute! Their cookie cutters are so cute! I want to get the gift tag cookie cutter! Love the Happy Birthday greeting card with the ice cream cone! Everything else is adorable too! Okay, I absolutely love their straws!! Especially the blue lace ones!! So pretty!! Fun!!! I love anything stationery. The recipe cards are super cute too! Love these! It's hard to pick just one item, but I'm loving the glitter twine and the glitter envelopes. I have a thing for anything with glitter! I love the gold twine! And the heart stickers..so many pretty things! Basically everything in this shop is dreamy! Thanks for the sweet giveaway! One of my favorites is the Oh Happy Day greeting card. The gold heart stickers are fabulous too! Ooh, I love their sweet glitter garland!! Ahhh, what an amazing giveaway! Thanks, girl! I absolutely love ruffled paper, and that twine is awesome! I love their envelopes with gold glitter liners. SO pretty!